We are among the top 450 universities worldwide! Recognized as Turkey's most entrepreneurial and innovative university, Sabancı advanced 30 places on the QS World University Rankings of the most prestigious institutions in the world, and ranked between 441th and 450th place. Sabancı University is the 3rd best Turkish university on the QS World University Rankings. 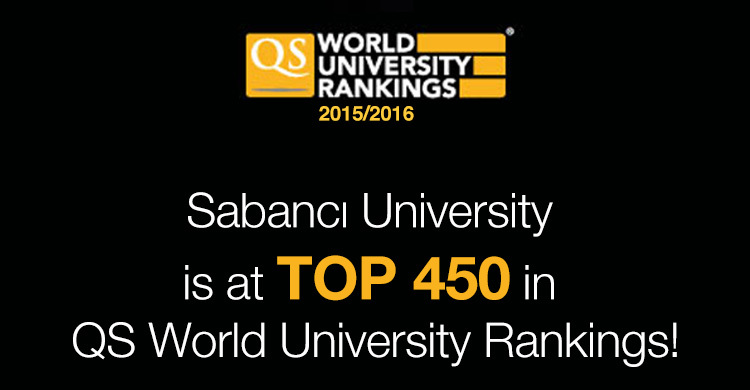 Sabancı was the highest-advancing entrant on the QS World University Rankings this year. Sabancı University ranked between 441th and 450th on the QS World University Rankings, one of the world's most prestigious university rankings. QS World University Rankings evaluates more than 800 universities worldwide on six indicators based on four criteria determined to be relevant to prospective students, namely research, teaching, employability and international outlook. Other Turkish universities featured in the top 500 of the QS World University Rankings are Bilkent University, Middle East Technical University, Boğaziçi University and Koç University. Click for the complete list of QS World University Rankings.